Let me take you on a drive through the streets of Port-au-Prince. I am afraid I cannot tell you the street names, but they are pretty meaningless now anyway, and the tour you are about to embark on could be anywhere in the city, to tell you the truth. Look up there, hanging above the road - a tatty, old piece of wood, white, with blue writing on it asking for help. The arrow points into a courtyard, in which you can see several vehicles, and some people lying under the shade of some trees. Now here, a few hundred metres along the road, another sign with no punctuation: "Please help UN US Need Food Water Medicine". In another street, a group of people, men and women, with scarves tied over their mouths to protect them from the dust and the smell tell us to stop. We will have to go round another way, one says, this road is too dangerous. There are pieces of rubble across the street - a makeshift road block. The men and women are local people, looking after their own neighbourhood. Further along there is a group of men putting up a banner, across the entrance to a side street. "Camp des Refuges de St Patrick," it reads. There is even an e-mail address underneath, though how they expect to receive any e-mails I do not know. Under the banner and along the road there is a group of men who want to know why we are there. One of them takes us further, as the others continue to work out how best to help their street, their people. At the end, bathed in the orange glow of the setting sun, sit mothers and children. Out in the street, ropes strung across the lane between the shattered buildings hold up sheets. They form makeshift shelters under which they will spend the night. All this has been set up by the people themselves. 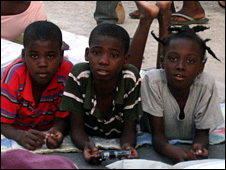 During the last week in Haiti, I was left with one overwhelming impression - it is the survivors who are helping themselves. They are pulling together, not tearing themselves apart. Much has been made of the potential for violence, but I did not feel unsafe. Not once did I think the crowds might turn on me. When I gave some food and water to a family we had been filming, others who had nothing stood silently by, glad that at least someone was getting a little help. Some of the aid agencies say they fear riots may start if they start to distribute supplies in the hundreds of makeshift camps where people have gathered. I fear riots in the long-term if they do not start distributing supplies right now. There has been some sporadic violence. That should be expected. It would happen anywhere. Look at what happened in New Orleans after Hurricane Katrina. 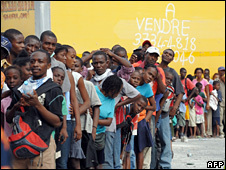 But to use the threat of violence as a reason for not distributing aid is an affront to the people of Haiti and their own humanity. Given the scale of the disaster, should we not be focusing on how little violence there is, rather than the rare moments when frustration spills over into fighting? We should certainly be concerned about overstating the security fears and undermining the aid effort, thereby exacerbating people's frustration and increasing the likelihood of violence. Earlier this week former US President Bill Clinton, the UN special envoy to Haiti, told the BBC: "When you consider that these people haven't slept for four days, haven't eaten, and have spent their nights wandering the streets tripping over dead bodies, I think they've behaved pretty well." 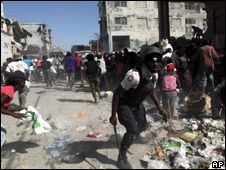 The US ambassador to Haiti, Kenneth Merten, meanwhile told PBS that "people should be aware that the vast majority of Haitians here are behaving in a calm and peaceful manner". There are now thousands of US soldiers on the ground in Haiti. In places they act as if they are in the middle of Iraq or Afghanistan, pushing back people, sealing off secure zones. One told a comrade that he feared another Somalia here. But that is the wrong approach. This is a humanitarian disaster, not a war. The soldiers and others are being welcomed - they are needed. For how much longer, though, will the people welcome them, if the aid continues to sit on the ground at the airport, rather than being put into the mouths of those who need it? 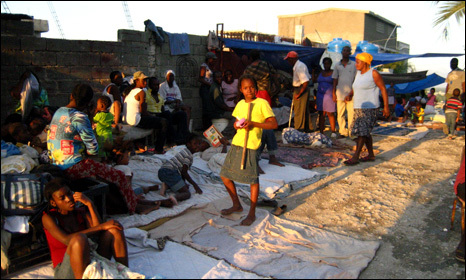 What are the priorities for the reconstruction effort? Why did so many die?